The biggest news of the week came at the very end of it with the Salem Red Sox announcing that outfielder Andrew Benintendi (pictured, right) has been promoted to Portland after hitting .341/.413/.563 over the first 34 games of the season. Reports surfaced this week that the Red Sox were being investigated by Major League Baseball for their 2015 international signings from Venezuela. MLB is looking into whether the Red Sox violated the international bonus pools and associated rules by signing players to "package deals." Ben Badler of Baseball America was the first to break the news of the investigation, and he has more details including sources telling him that the interview process was concerning, with the players not having proper representation, told to hand over bank account information, and threatened with suspension. MLB generally does not punish players for their involvement in a rules violation like the one the Red Sox are accused of, ESPN's Keith Law writes. An agreement has been reached to sell the Lowell Spinners to Main Street Baseball as James Dunne writes. Main Street Baseball currently owns several other minor league teams including the Blue Rocks (Royals), High Desert Mavericks (Rangers), Quad City River Bandits (Astros), and Billings Mustangs (Reds). The sale is pending New York-Penn League, Minor League Baseball, and MLB approval. While Yoan Moncada and Andrew Benintendi are getting all the attention, another Salem player is also drawing plenty of positive praise from scouts - Mauricio Dubon. Alex Speier of the Boston Globe gives notes from scouts about how Dubon has managed to impress despite being surrounded by a team that a scout says has "so many good players it’s disgusting". In that same piece, Speier also says both Michael Chavis and Michael Kopech have resumed baseball activities after both sustained hand injuries earlier this spring. Blake Swihart remains with Pawtucket after starting the year hitting .250/.343/.326 over 26 games for Boston. He has been seeing time at both catcher and in the outfield, and Speier writes for Baseball America that Swihart still aims to be a catcher. 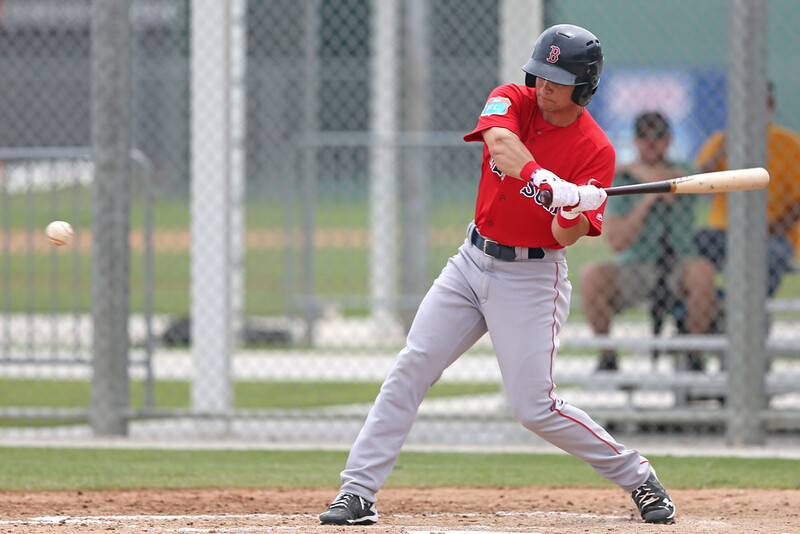 SoxProspects Director of Scouting Ian Cundall saw him on his last trip to Pawtucket, and he says Swihart made the plays, but that he is definitely still a work in progress as an outfielder. Kevin Thomas of the Portland Press Herald notes that Jordan Weems has been sent down to Fort Myers to transition to the mound. Earlier this year he was moved to first base after spending his entire professional career as a catcher. He will now try and follow the path that Williams Jerez has set when he transitioned to the mound after beginning his career as an outfielder. With the Angles struggles and injuries, speculation has begun on whether they would be willing to trade Mike Trout, their star center fielder and one of the best players in the game. Brian MacPherson writes for the Providence Journal that the Red Sox would be a good fit with their depth of young talent in the majors and elite talent in their farm system. However, names like Moncada and Rafael Devers are mentioned as possible players that would need to be included to make such a deal happen. Draft season is starting to ramp up as the draft nears. Baseball America is well into their coverage and came out with their third mock draft this week. It has the Red Sox selecting Miami catcher Zack Collins with the 12th overall pick. MLB.com also had a mock draft, their first, and they have the Red Sox selecting Taylor Trammell, a high school outfielder out of Mount Paran Christian School in Georgia. Law has yet to release a mock draft, but he did release his Top 100 draft rankings this week. He has Collins at 18 and Trammel way down at 44. Nate Freiman was been a part of Major League playoff teams back in 2013 and 2014. Freiman, who went to Wellesley High School, has his eyes on a return to the majors, but until he does he is using his professional experience to set the example for the rest of the Sea Dogs, as Kevin Thomas writes for the Portland Press Herald. Obviously, it was a very strong week for Ockimey (pictured, left) overall, but the success was very much front loaded. He came flying out of the gate collecting almost all of his stats over the first three games of the week, with multiple hits in each outing. His standout game came on Thursday when he went 2-for-4 with four RBI, a walk, a home run, a double, and a strikeout. His performance slowed way down over the weekend, finishing 0-for-6 with two strikeouts, a walk, and an RBI over his final two games. It was still a strong week overall, and the first baseman raised his overall slash line on the year to an impressive .300/.442/.600 with the best slugging percentage and OPS in the South Atlantic League. And although he was not so honored by this site, Ockimey's teammate, Mitch Gunsolus was honored by the South Atlantic League as its player of the week. Gunsolus hit .370/.433/.704 with two home runs--both grand slams--three doubles, nine RBI and six runs scored. Gunsolus's 10 hits in 27 at-bats over six games tipped the scales for him in the league office over Ockimey's arguably stronger performance in five contests. Haley was coming off a very strong start where he went seven innings without allowing a run on four hits and two walks while striking out five. It seemed hard to top, but Haley managed to do it this past Friday against the Binghamton Mets. Haley again went seven innings, but this week he allowed only one hit while walking three and collecting five strikeouts. The Mets sit in second to last in the Eastern Division, with the Sea Dogs the only team trailing them, but Haley was able to secure a win off the strong outing. This was the latest strong start in a string of strong starts to begin the year. Over his last four starts he has lowered his season ERA and season WHIP each time out, ultimately bringing them all the way down to their current mark of 1.93 and 1.13, respectively. 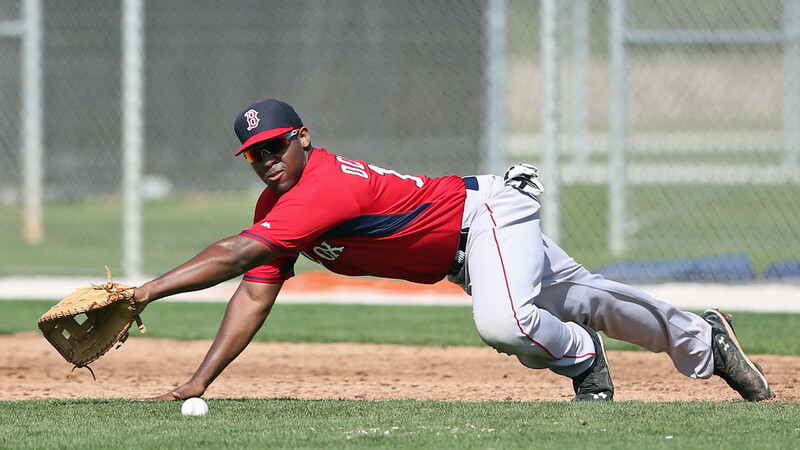 Photo Credit: Andrew Benintendi and Josh Ockimey by Kelly O'Connor.